Japanese male and female musicians playing music. 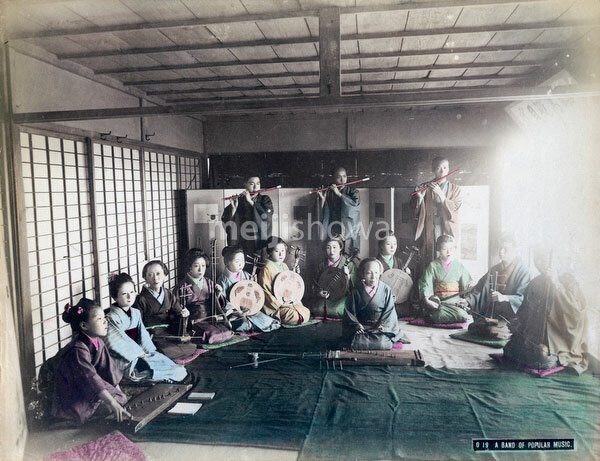 From left to right: a girl playing a Chinese zither, two women playing the teikin or niko, four women playing the gekkin (Chinese string instrument), a woman playing an unindentified instrument that may be a sanshin (three stringed instrument of Chinese origin), and two men playing the teikin or niko. The three men in the back play bamboo flutes that appear to be Chinese dizi. The woman in the front plays a Chinese zither.